(Above) are of the Registrar of Societies' NOTICE to the DAP (addressed to the DAP secretary general and Lim Kit Siang's son Lim Guan Eng). The content of the NOTICE should be crystal clear even to a STD 6 student. If I am the secretary general of the DAP, I would have called for an emergency CEC meeting immediately after receiving the NOTICE on the 17th of April or the next day (18th of April, 2013) and re-appoint the DAP's office bearers. That would have been a 15-minutes task IF the 20 member CEC fully endorsed DAP's current list of office bearers. 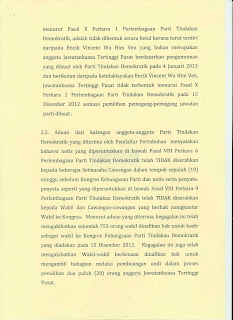 All you (Lim Guan Eng) had to do was to get the CEC to agree to a motion endorsing the existing office bearers and the PROBLEM would have been SOLVED! The new list could have been submitted to the RoS within hours. But what did Lim Guan Eng and his father Lim Kit Siang do? 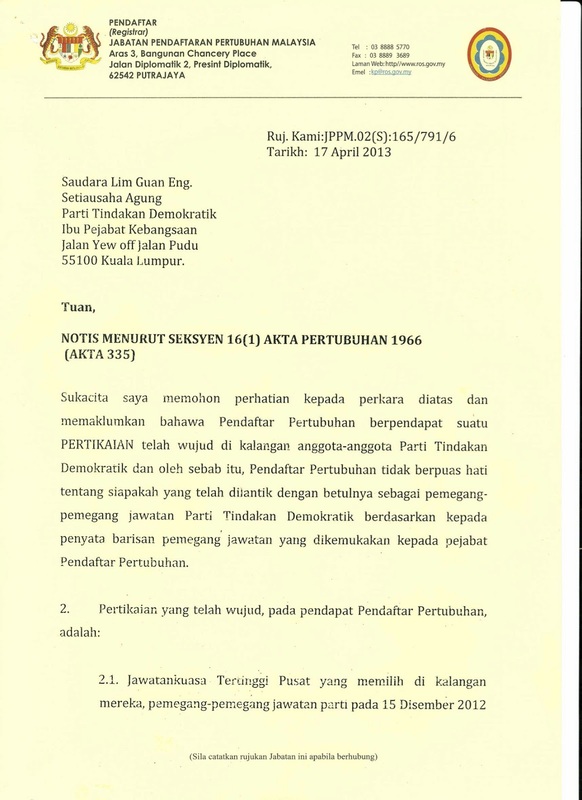 Why didn't Lim Guan Eng the secretary general of DAP call for a CEC meeting immediately after receiving the RoS NOTICE on the 17th of April, 2013? Why did Kit Siang and Guan Eng choose to put up a sandiwara and blame everybody else except for themselves? Did the RoS NOTICE state that the DAP can't take part in the 13th General Election or did it spell out that the DAP was barred from using their Rocket in the General Elections? What was all those noise and tears about? Were the father and son of the Lim dynasty in DAP worried that the CEC members would have turned the tables on them at the 11th hour before the party enters into the GE? I'm sure Malaysians are mature enough to put the facts on the table and arrive at a conclusion, without being influenced by Kit Siang's tears or Guan Eng's outright lies. The Home Minister said the other day that Kit Siang must have cried because of the internal problems in DAP which led to the party members lodging reports and complaints to the RoS. Over and above the DAP vs RoS drama put up by the Lims, latest developments in the DAP certainly demands more tears from Kit Siang. Kit Siang's greatest nightmare now is not his BN opponent in Gelang Patah but the pretty ex-DAP ADUN of Teratai- Jenice Lee and ex-DAP MP Manoharan. These two former elected representatives of DAP are now openly questioning the legitimacy of Lim Guan Eng's position as the secretary general ... and all those fanning him from down under. Who is victimising whom now? Ghani Othman is not Kit Siang's biggest nightmare because he fears his son (Guan Eng) losing control of the DAP more than him being trashed by the Johor BN chairman and one of the best MB the state has ever had. Kit Siang is prepared to lose in Gelang Patah and retire from politics but he is certainly not prepared to let DAP slip away from the iron grip of the Lim Dynasty. An impending implosion in the DAP? Let's wait for the real sandiwara or a classic Lim Dynasty opera. The Lim duo has put on a brilliant performance! The way they manipulated and lied and deceived....I'm impressed! Move over, Anwar...here comes the new Drama Queens! However, while the more level-headed (notice that I didn't say "intelligent") Malaysians was not duped, quite a number of them fell for this performance hook, line & sinker. Goes to show the mentality of PR supporters. Totally agree with you on this issue...LGE should have rectified the matter. ROC standing for elections or not? Is it part of BN ah? Mungkin ini di maksudkan dengan "kebebasan tanpa penindasan; kesaksamaan peluang diutamakan berbanding kesaksamaan hasil;" seperti di bahagian mukadimah matlamat-matlamat, Fasal II, menurut perlembagaan parti DAP. 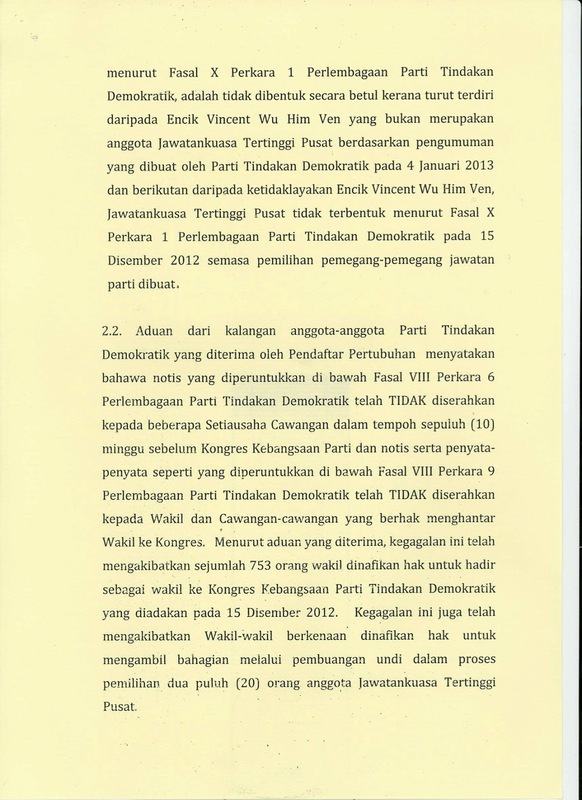 Seronok juga membaca dan mengkaji perlembagaan setiap parti politik sementara menunggu hari mengundi. 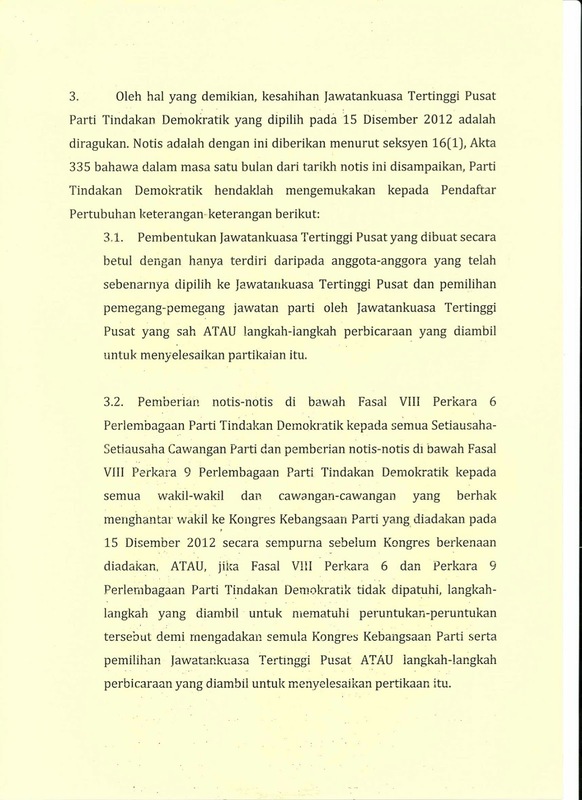 The best part is Fasal IV, Syarat-syarat keahlian nombor 12(a) dan (b) mengenai caruman wajib calon-calon yang berjaya kelak sehingga pencen kepada dana Parti ikut suka berapa dan bila oleh JKT Pusat. 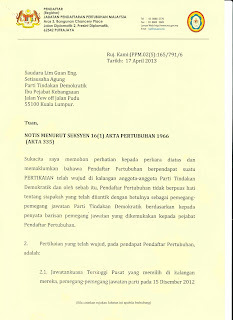 PR's supporter from my area state that, even though ROS did not barred the use of DAP logo for election, the notice caused DAP not to be able to issue the 'surat watikah'. If that is the case, no DAP candidates can be pointed for the election. Hence they go for PAS logo since PAS can issue the 'surat watikah' for their candidates. As a result of that, DAP needs to use PAS logo instead.